DeZURIK Cast Knife Gate Valves (KGC) are designed for on-off and throttling applications. They feature a cast body in 304, 316 or 317 stainless steel. The gate material is 304, 316 or 317 stainless steel. The packing gland is stainless steel for corrosion protection or coated carbon steel for noncorrosive service. The stem is stainless steel. The yoke is available in 316 stainless steel for corrosive service or carbon steel for noncorrosive service. 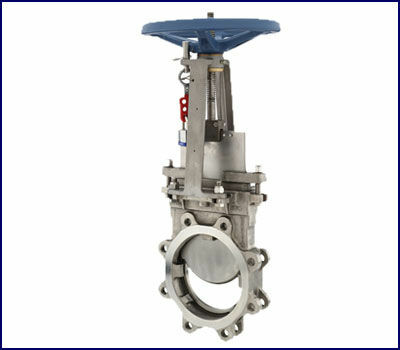 KGC Knife Gate Valves are available in sizes 2–36" (50–900mm) with metal or resilient seated versions. A variety of actuator options are available including handwheels, chainwheels, bevel gears, levers, pneumatic and hydraulic cylinders and electric motors. A full complement of accessories is also offered. The heavy duty, cast body provides corrosion and abrasion resistance on the toughest liquid slurry and dry material handling applications. The cast gate guides at 3, 9, and 12 o’clock provide support for the moving gate and won’t break off like welded guides. Cast gate jams at the bottom of the body hold the gate securely against the seat to assure positive shutoff. All valves are rated for full reverse pressure in the closed position. Raised-face body has drilled and tapped lugs in accordance with ANSI Class 125/150 dimensions. Full, round port design allows high flow capacity and minimum pressure drop. DeZURIK’s KGC valve seat I.D. is equal to the I.D. of schedule 40 pipe. Gates are available in 304, 316 or 317 stainless steel for corrosion resistance. They have a precision ground finish on both sides to prevent packing and seat damage. The beveled knife-like edge pushes aside or cuts through solids in the flow stream. To increase packing life and provide a superior seal, the gate edges are rounded. A strong investment cast clip complements KGC’s robust construction. More threads per inch on the manual stem mean this valve requires lower handwheel rim-pull force. DeZURIK KGC Valves have a unique packing system that ensures a long-life tight seal with minimal packing gland pressure. The packing system is available for general, moderate, severe and high temperature applications. The machined packing chamber and an antiextrusion ring form the base of this system. The system is completed by careful selection of the packing material. The temperature, pH, and media properties will determine the most suitable option. Both metal and resilient seated valves are offered in a full, round port design. The integral metal seated version is available with shutoff capability exceeding current TAPPI TIS 405-8 and MSS-SP81 standards. Resilient seated valves are available for applications where drip-tight shutoff is required. Unlike valves which use an o-ring seal, DeZURIK Knife Gates have a resilient seat designed especially for knife gate valve applications. The resilient seat material is bonded into a stainless steel seat ring. When the valve is closed, the gate is pushed against the seat and held in place by the gate jams. When the valve is open, the gate moves away from the seat, allowing operating clearance, which prevents seat damage and makes operation easy. A variety of resilient seat materials are available. Options include chloroprene (CR), acrylonitrile butadiene (NBR), chloro-sulfonyl-polyethylene (CSM), fluoro rubber (FKM), off-white chloroprene (CRW), and terpolymer of Ethylene, propylene and a diene (EPDM). A metal-seated V-port design is also available for reliable throttling control of thick slurries — including paper stock. The constant V-orifice is maintained from open to closed to prevent bridging or plugging and to ensure maximum control accuracy. KGC provides the latest in lockout design technology to protect both lives and the environment. Unique designs for both manual and automated models are available. The patent pending lockout collar for the automated models allows fine adjustment to ensure tight shutoff or maximum opening. A variety of accessories are offered as standard, including handwheel extensions, floorstands and a variety of cylinder actuator accessories for customizing the valve/actuator package to meet specific application requirements.